I actually wanted to make chicken stirfry with fermented black beans, like the one CeliaK made, but when I went to go cook, I realized I didn’t have any black beans, so I cooked it anyway and just pretended like it had ‘tausi’. Well, another improvisation, but it still worked. Heat oil in wok or large skillet. Add garlic and ginger and stirfry until fragrant, then add onions and stirfry for another minute. Add chicken pieces and stirfry for a few minutes more. Add 1 cup of water, and cover to simmer until tender, about 30 minutes. When the chicken is tender, the liquid will probably have reduced to about 1/4 of a cup. At this point, add the oyster sauce and hoisin sauce and stir. 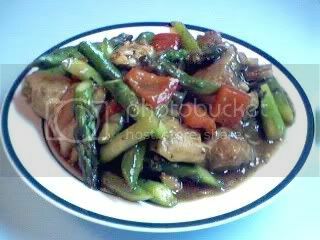 Then add the asparagus and red bell peppers and stir fry for a couple of minutes until they are cooked through but not soft. They will render some liquid, you can thicken any liquid left in the pan with the cornstarch mixture. Adjust the seasonings to your taste, and serve.